We left you last time in Brazil in the dire city of Corumba - where we seemed to have to wait forever for the train that would take us from Quijarra, just over the Bolivian border, to Santa Cruz. We had a relatively simple border crossing and the train journey - although a long 19 hours instead of 12 - was quite enjoyable (especially after they turned off the unneccessarily loud music videos with the spanish stud Marco Antonio Solis). Our stay in Santa Cruz was a short one and we moved out into the countryside to the little village of Samaipata. Situated just outside of Samaipata are the pre-Inca ruins "El Fuerte" (The Fortress). The main rock is really impressive and not nearly as excavated as other South American ruins so it was good to have seen it now. Set in stunning mountains Samaipata was a pleasant place to get stuck for three days because of political protest road blocks! It was impossible for us to get a bus from Santa Cruz to Sucre. By the fourth day the four of us had had enough (we have travelled almost all of Bolivia with Noortje and Martine, the Dutch girls from the Brazilian Pantanal!). So, after alot of advice from Frank (a German tour operator in Samaipata - not the drug helpline), we decided to tackle the road blocades by a series of taxi journeys and walking! Passing the blocades on foot was fun - the locals thought we were nutty gringos. They were laughing at us and asking us why we didn´t just stop and wait with them. It was a strange sight - hundreds of trucks backed up for days just because of some sand and cactus´ across the road, little camps had been set up on the roadsides for people as well! Once across two blocades we managed to get our amigo taxi driver Carlos (and his little nephew) to take us to Aiquile (a very bumpy taxi ride), from where we were able to get an (illegal) evening bus into Sucre (a very dodgy ride, with dodgy characters but fun all the same!) It was certainly an adventurous day but we managed to get ourselves to Sucre by midnight! Travelling in numbers has been great; increased bargaining power, it feels abit safer, we have had more fun (maybe not Pug surrounded by 3 constantly talking girls) and it helps that the girls can speak a little more spanish and are great at organising everything quickly! Sucre was a breath of fresh air after the previous day. Although a big and busy city we found it mellow and clean! With gorgeous white washed colonial buildings. The plazas and views from the hills and churches we climbed were fab. 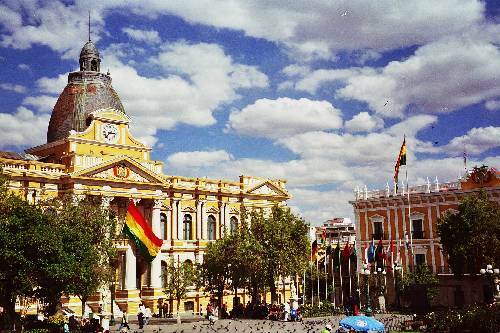 It was a nice suprise to find such a pleasant city in the middle of Bolivia. We were also lucky to be there during the weekend when they were practicing for the Virgin Guadalupe festival, although after seeing the practice the actual festival must have been crazy. Lots of dancing, music, drinking and fireworks going off all around (no health and safety = sometimes fireworks are a little too close!). This went on late into the night all weekend - and it was only a practice run! Bolivians sure do love a party! After spending a few days being comfortable and loving Sucre we moved on to the contrasting city of Potosi. Being the highest city in the world at 4060m it was a little breath taking (walking up stairs can prove difficult!). It was the centre for Spanish silver mining in the Colonial period and the mines are still operating, though for zinc, today. In comparison to Sucre the city seemed more oppressive - the people are not so happy (or partying all the time), there´s more poverty and a tougher lifestyle, this is emphazised by the tightness of the city streets. Pug made a trip into the mines for a few hours. It was quite interesting but quite horrid. It is impossible to think that people still spend their working lives down there. Most won´t make it to 50. Two hours of dark, hot and cramped passages filled with near unbreathable dusty air was enough for this tourist. At least I got to play with coco leaves and dynamite! Wimping out with Martine and Noortje, Lara visited the surrounding countryside instead of the mines - which had plenty of delicious breathable air. The colours of the surrounding mountains were incredible - reds, pinks, browns, greens and others. We visited the village of Miraflores, where volcanic hot water springs run and were fascinated to see the locals using it to wash their clothes. Before returning to Potosi we made a stop at the Laguna Tarapaya - a volcanic lagoon, where we had a quick dip. Our last day in Potosi was a time killer waiting for a night bus to Tupiza - where the four of us were hoping to begin a 4 day trip together through the beautiful south Bolivian landscapes up to Salar De Uyuni. Unfortunately the girls had a disappointing market experience with some unfriendly people but at least managed to stock up with some warmer clothes for the trip. Once in Tupiza, following a pretty awful bus trip (which included the drivers trying to change the bus tyre in the dark with everyone still on the bus!) we managed to sort ourselves out and book on a tour. Leaving early the next morning in our own jeep complete with own driver/guide (Elias) and cook (Emma) we started an incredible journey. Definitely one of the highlights of our world tour, we drove through martian-esque deserts, pampas, highlands (up to 5000m), volcanoes and past coloured lagoons filled with thousands of pink flamingoes. Expecting the worst we thought we would freeze during the nights but our accommodation was pretty good, and wrapping up warm helped. The first night we stayed with a Bolivian farming family which was great fun. The children were very funny, and with our little spanish we did manage to understand and be understood. It was an appreciated insight to a completely different way of life to our own. Our second night was spent overlooking the Laguna Colorado, where we watched a gorgeous sunset over the red lagoon. Having Emma along on the trip was great, although it did mean that we have been fed up abit too much! We finished our 4 days at the amazing Salar De Uyuni - the largest salt flat in the world, 12,000km2, and at a height of 3650m. We got up early and left our hostel on the edge of the Salar to watch the sunrise - colours in the sky and the brightness of the moon before it went behind the mountains was fantastic to see. From the centre it seems to extend forever - mass expanse of blinding white that plays tricks on your eyes! Don´t think we can name one highlight because it was all so different and "so muy!" (Dutch for really beautiful). We took far too many photos of the trip but even if they can´t show you exactly how incredible the 4 day trip was, they can show you more than we can describe (mostly because we haven´t the literary skills of Dr Matt Destruction - or eaten lunch yet today). We are now however completely in love with Bolivia! Unfortunately our trip ended in the town of Uyuni, which wasn´t impressive at all! Only a few hours here though before we hopped on an overnight bus last night to La Paz - the worst bus trip yet with 5 of the 11 hours on dreadful road where we thought the bus would fall apart. Reaching La Paz nice and early we bumped into Pug´s home friends - Bungy, Kev and John - before they left the hostel for Copacabana. Due to bad weather we might not be able to visit Rurrenbeque for an Amazonian trip (Lara´s sad to be missing out on seeing pink river dolphins) and we are currently trying to come up with another plan. This could possibly involve some beers with the boys on the 24th (and hopefully a bike trip down the Death road!). Not sure what the news is saying over there about current situations in Bolivia but apart from the road blocades (which were totally peaceful) we haven´t really seen anything - except for fully garbed police forces opposite our hostel, but then it is opposite the police station. Now we´ve got to go because Pug is hungry and won´t stop moaning about it so we´re off to find some Salteñas.